Twenty-five years ago, Captain Jean-Luc Picard conducted breakthrough negotiations with an aggressive race called the Gorn. On the anniversary of that achievement, Captain Picard and the U.S.S. Enterprise are headed for the Gorn Homeworld to continue that important work. When the ship stops to investigate a mysterious alien artifact, Captain Picard is suddenly hurled through time and space. Just as Commander Riker and the Starship Enterprise crew begin an impossible search for their captain, the Gorn summit goes terribly wrong. 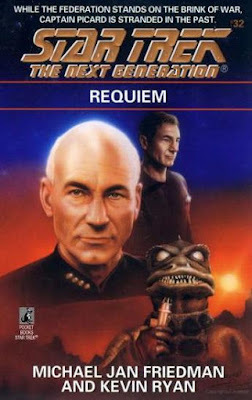 As war looms over the galaxy and Picard is desperately needed on the Gorn Homeworld, the captain finds himself stranded in the past on a planet called Cestus III at a crucial turning point in Federation history. Caught in a deadly situation that challenges Picard's most cherished beliefs, he must weigh the fate of a world against the future of the entire Federation. Ever since their appearance in the Original Series episode "Arena," fans of Star Trek have been fascinated by the Gorn. Huge, hulking reptiles, the Gorn seem like a fearsome enemy that, interestingly enough, was not revisited again in canon Star Trek until nearly 40 years after their debut. However, the novels and comics have tackled the Gorn on many occasions, and Requiem is one such foray into bringing the Gorn into the 24th century. Because Captain Picard has some experience with the Gorn from his time as captain of the U.S.S. Stargazer, he is called upon to serve as the Federation's representative in tense negotiations with the Gorn Hegemony. However, en route to the Gorn homeworld, the Enterprise investigates a strange construct in space. Aboard the alien behemoth, an accident propels Captain Picard back in time, depositing him on a nearby world nearly a century in the past. That world: Cestus III, site of a brutal Gorn surprise attack that completely wiped out a newly-established Federation colony and Starfleet base. And, of course, Picard finds himself mere days before that fateful event. The Cestus III colony, destroyed in "Arena," is the main setting for much of this novel. I enjoyed Requiem's look at a pivotal event in the original Star Trek and the added layers it brought to the episode "Arena." 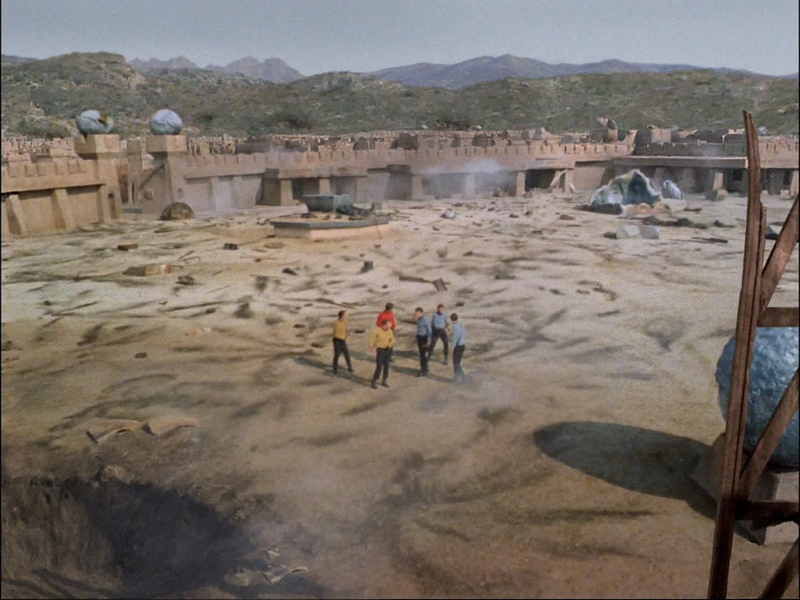 In that episode, we first see Cestus III following the Gorn attack, with one lone survivor rescued by Kirk and a landing party. In Requiem, we get to know a number of characters who make up the crew of the base. From Picard's perspective, they all perished in the attack decades before he was born, but when seeing them face-to-face, you can feel the captain's anguish at having to keep the knowledge of their fates to himself to ensure the integrity of the timeline. Picard gets attached to one woman in particular, the base's doctor, which adds complications to his need to ensure that events proceed as history recorded them. There is some great stuff in this novel with regards to the base's commander and his distrust of Picard, but in the end they see each other as comrades in arms when the base comes under attack. Meanwhile, back in the 24th century, the crew of the Enterprise is desperately trying to locate their captain. This was also an interesting aspect of the story, as the crew is desperate to recover Picard not just to get their captain back, but because his expertise is needed to negotiate with the Gorn and quell the rapidly deteriorating situation on the Gorn homeworld. I especially liked the small arc that Reg Barclay gets in this part of the story. 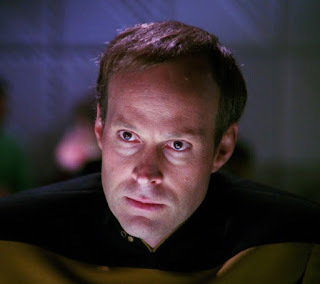 He feels that it was his fault that Picard was thrown back in time, and he finds himself paralyzed with fear when dealing with the alien mechanism. He must overcome that fear in order for the mission to succeed, which, of course, he does. Reg Barclay gets an interesting story arc in Requiem. The ultimate solution to the problem at hand is interesting to be sure, but of course we knew that Picard's rescue was inevitable. I was surprised at some of his actions in the past, but in the end he does what he needs to in order to keep from polluting the timeline and changing historical events. The only thing I would fault Requiem for is the fact that we don't really learn anything new about the Gorn themselves. I would have liked to have gotten a look at their society on the Gorn homeworld and learn more about how they operate. Beyond the fact that they protect their borders and their species with great ferocity, we don't learn much more about the Gorn in this novel than we do from their appearance in "Arena." However, I can't really fault the book for this too much, as it has more to do with my expectations going in than what the story was ultimately about. A solid entry in the TNG numbered novels series. It was fascinating to get a look at the Cestus III colony before the Gorn attack and learn a bit about the people who lived and worked there. Their story is tragic, but the role they play in Star Trek history is an important one. I would have liked to have learned more about the Gorn, but alas that was not to be. The story set in the "present" of the 24th century was a nice B-plot involving the Enterprise crew attempting to locate and rescue Picard, with some great character moments for Reg Barclay. 4/5. The conclusion to the Deep Space Nine: Millennium saga: Inferno by Judith & Garfield Reeves-Stevens!